Did the First CIA War Cat Complete the Mission? 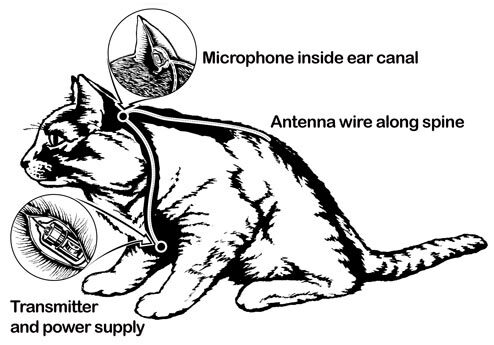 War cat – CIA project “Acoustic Kitty” to spy on- There used to be a project called Acoustic Kitty in CIA in 1960’s. There’s a long history of using dogs in military and police operations with some of the dogs outfitted with cameras and other sophisticated technological equipment. But cats? Yes. Once cats were trained to be spies and put on the first espionage operation with the hidden spy equipments… How did it go? How Was a War Cat Born? The CIA once tried to train cats to be spies in 1960’s, in the cold war era. Did they achieve their first intended goal? Let’s cut to the chase. They failed. After the 5 years of research and $20 million spent. Little details about Acoustic Kitty program. The CIA built a 3/4-inch-long transmitter to embed at the base of the cat’s skull. Put the microphone in the ear canal, and the antenna which was made from fine wire and woven, all the way to the tail, through the cat’s long fur to conceal it. Due to the small size of cat’s body, the smallest batteries were used and it restricted the capability of recording time. After the many tests, cats’ comfort, maneuverability, and normal behavior were ensured, they proceeded to wire up the first fully functional agent. Putting on equipment took about an hour with a vet, but it went smooth. The hardest part was training the cat to follow directions. Anyway, the day has come. For the first field test, a CIA reconnaissance van was across the street from a park, where the marks were sitting on a bench outside the Soviet compound on Wisconsin Avenue in Washington. The very first mission was to eavesdrop on these two men. The cat hopped out of the van, started across the road, and was promptly hit and killed by a taxi. It turned out to be the very last mission of using a cat as an agent. A CIA operative returned to the accident site and collected the spy’s remains after the cat’s death. They didn’t want the Soviets to get their hands on the audio equipment. With her death, the cat with long gray and white fur, a top-secret plan to turn a cat living, walking surveillance machine ended. Project Acoustic Kitty was completely abandoned in 1967. Yes, you can train a cat to a point. Using a treat, you can make them come on a command, even shake their hands. It can be done to have a cat walk on a leash, or to make them use a toilet instead of using a cat litter by training. Well, but on a spy or military mission? We just can’t imagine cats go to a desert or mountains with their soldier partners and execute the operation. Cats obviously are not a great choice in terms of training and executing military or police operations as war cat . However, Bob Bailey, the first director of training for the Navy’s pioneering dolphin program says We never found an animal we could not train. In his 55+ year career, Bob has trained or supervised the training of more than 140 species, totaling over 10,000 individuals. Bob has experience training animals and personnel to perform tasks in operational environments. For example, he had trained a spider in the bathroom. Turn on the laser. Blow. Turn on the laser. Blow. He repeated this at several intervals during the day. Since spiders don’t like the wind, which blows their web down, so once you blow, spiders get defensive by pulling themselves down into the smallest size they can get and hunker down. By the time Bob finished, all he had to do is turn that light on and the spider would go defensive without a blow. Over time, the spider associates one with the other that the mere appearance of the former is enough to trigger a conditioned response. Who would be today’s animal training inspiration? That should be B.F. Skinner. He is an American psychologist, the most cited scholar of the human mind after Freud. Skinner is best known for developing the theory of behaviorism and for his utopian novel Walden Two (1948). He presented a fictional interpretation of some of his views in Walden Two, which proposed a type of utopian society. The people in the society were led to be good citizens through behavior modification — a system of rewards and punishments. Skinner developed what he called an operant conditioning apparatus to do this, which became better known as the Skinner box . With this device, Skinner could study an animal interacting with its environment. He first studied rats in his experiments, seeing how the rodents discovered and used to a level in the box, which dispensed food at varying intervals. Later, Skinner examined what behavior patterns developed in pigeons using the box. The pigeons pecked at a disc to gain access to food. In this box, an animal learns to associate an action with a reward. Not like Ian Pavlov’s classical conditioning aka Pavlov’s Dogs, this is a practice based less on primal reflex response and more on getting animals (including humans) to do things voluntarily, based on cues in the environment. Skinner believed that positive reinforcement was a great tool for shaping behavior and learning new behavior. He published the results of his operant conditioning experiments in The Behavior of Organisms (1938). Although CIA’s feline spy project broke down, research and projects to mimic feline proportion and behaviors continues. Funded by DARPA’s Maximum Mobility and Manipulation program, this feline robot was developed by Boston Dynamics, outside version is called WildCat . Where there is war, the huge investment comes or vice versa. Here is a war cat with a stern look WildCat being developed and improvement is undergoing every day.